This challenge asks for people to blog about how a family history has been affected by the service of an ANZAC (originally an acronym for Australia and New Zealand Army Corps). None of the men on the roll of honour are my blood family, but we are all connected by the kinship of ringing. Once you’ve become a ringer you can travel to the other side of the world, just as Ernest Hamblin did, and immediately be welcomed into a new family of ringers. Ernest James Hamblin was born in the Cookham registration district (in the English county of Berkshire) on 1 July 1890. The 1891 census took place on 5 April, Ernest is to be found as a 7 month old, living at Hamfield Cottages, Cookham with his parents Charles James Hamblin (27) a gardener domestic and Alice Ada (26); along with his older brother, Stephen Charles (2). While Charles was a Berkshire man, having been born in Wokingham, Alice was from Hammersmith (London) and Stephen is recorded as being born in West Dulwich, Surrey (now Greater London). By 1901 the family had moved to Hersham and were living at 3 West Grove Villas. Ernest now had two younger sisters: Ada Margaret (5) – born Cookham; and Helena Kate (1) – born Walton, Surrey (Walton-on-Thames is adjacent to Hersham, and Hersham was part of the civil parish of Walton). It was also in 1901 that the church of St Peter’s, Hersham received its ring of 8 bells. George Woodiss, father of Frederic George Woodiss who is also listed on the roll (but as a Banstead ringer), along with a couple of ringers who already lived nearby, was instrumental in training a new band. I’ve not yet established if Charles James was a ringer before this, or was one of the new ringers at this time. Nor have I found when Ernest started ringing, but since he is recorded as a Hersham ringer it must have been before 1909, when a report of farewell ringing for Charles James Hamblin was published in Bell News. The family moved to Woking, and in 1911 are recorded as living at Heatly Cottages, Goldsworth Road. Charles was now working in a plant nursery, and Ernest had become a joiner. Stephen was not living in the family home, and I have not been able to trace him. Ada Margaret had also left home and was in service with Machin family at Oatlands, not far from Hersham. The Machins were obviously quite well to do, the head of the household, Stanley, is recorded as a “manufacturing confectioner”. He had been married for 23 years and he and his wife had 10 children, six of whom were still at home. There were two other domestic servants in addition to Ada, and also a governess for the younger children (the ages of those at home ranged from 19 down to 5 – the two oldest boys, 19 and 14 are recorded as students, and a 9-year-old as a schoolboy, the other 3 were presumably in the charge of the governess). Ernest’s army service record states that he had been in New Zealand for about 5 years when he enlisted in late 1916. Since we know he was still in the UK for the census on 2 April 1911 he must have left after that. There is no exact match in the passenger records, but a man listed as Ernest Hamlin left London for Wellington, New Zealand, aboard the SS Arawara on 9 November 1911. His occupation is given as carpenter similar to his description as joiner in the 1911 census. The ship travelled via Plymouth (departed 11 November), Cape Town (departed 3 December), Tasmania (22 December), and Wellington, arriving 9 pm on 27 December (it would then continue to Lyttleton). According to a report in the Evening Post on 28 December it was a fairly uneventful voyage, with the weather largely good, though after leaving Hobart they did experience a gale in the Tasman Sea, thought that was not enough to prevent Christmas celebrations. It’s not clear if Ernest then travelled on straight away, or remained in the Wellington area for a while. On 11 August 1912 Ernest was clearly in Auckland as he was part of the band which rang the first quarter peal on the bells of St Matthew-in-the-City. They rang 1260 changes of Grandsire Triples, and recorded the achievement with a painted board in the ringing chamber which is there to this day. 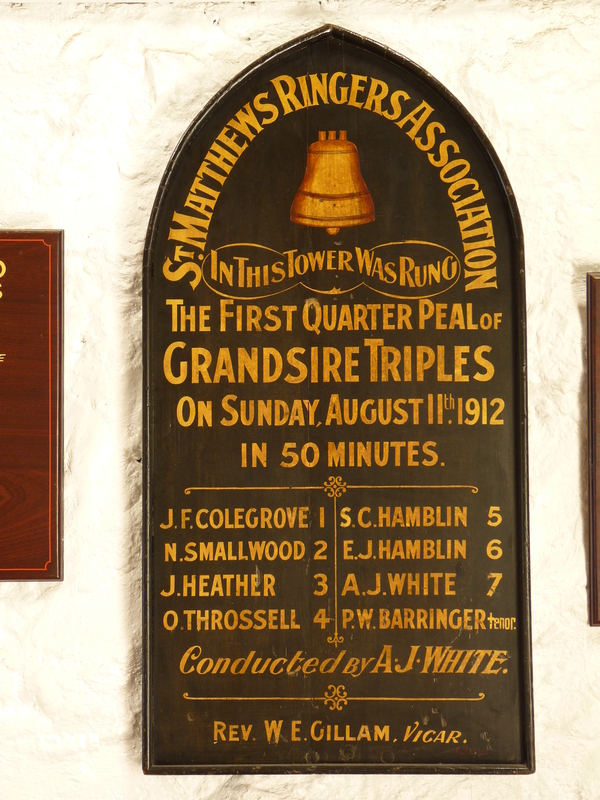 The present ringers marked the centenary of this event on 11 August 2012, ringing exactly the same composition. The band on that occasion was conducted by Frank Sluter, who by strange coincidence was among those who taught me to ring prior to his family emigrating to New Zealand. The original board shows that the band also contained one S C Hamblin, presumably Ernest’s older brother Stephen Charles, who must have emigrated earlier (which would explain why he was not to be found on the 1911 census of England and Wales – no record of his departure has yet been found however). In fact in researching this post, I then discovered an earlier article in The Ringing World, published on 2 August 1912, contributed by S C Hamblin. This confirms he was Ernest’s brother, and that both brothers initially lived in Napier. Their first significant ringing in Auckland was on 24 May 1912 when both rang in a touch of 720 changes, conducted by Stephen. A further 720 (of Pain Bob Minor) was rung on 3 June to mark the King’s birthday, again with both brothers involved and Stephen conducting. These were believed to be the longest pieces of ringing completed in New Zealand at that time. In addition to the board to mark their achievement the ringers held an evening entertainment for about 150 guests on 19 August. This consisted of various songs, hand bell ringing, a flute solo from another member of the band, C Throssell, originally from North Leach, Gloucestershire. A further quarter peal was rung for Sunday morning service on 24 November 1912. A third quarter was rung on Sunday 4 May 1913, marking the visit of HMS New Zealand, and there was additional ringing for the evening service that same day. On 9 August 2013 the band made their first attempt at ringing a full peal, but it broke down after 3332 changes (of the 5040 required). On 14 August 1913 the rest of the family: father, mother and Ernest’s two sisters also left London for New Zealand, travelling aboard the SS Athenic. Their departure was marked by various farewell ringing for Charles Hamblin. They arrived in Wellington on 29 September after a similar voyage to that undertaken by Ernest two years earlier. They reached Auckland on 1 October, and Stephen and Charles were part of the band which rang a quarter peal on 5 October (Ernest was not present). The Ringing World reports more ringing and social events organised by the St Matthew’s ringers, even after the outbreak of war in August 1914. Ringing clearly provided a way for the Hamblin family (its male members at least) to settle into their new community. Other aspects of their life in New Zealand appear to have been less settled. The first evidence of where the lived after arriving in Auckland comes from the Auckland City Council Bicycle Register Database 1910-1923. Ernest and his father, Charles, are both recorded as registering bicycles to 3 Wharf Road, Herne Bay. Ernest obtained his licence (entry number 7117), for a safety bicycle on 10 November 1913; Charles (entry number 8024) for a Swift bicycle a fortnight later, on 24 November. Stephen does not appear to have been a cyclist, though there is an entry for an S Hamlin registering a safety cycle in Panmure on 3 May 1917. By the time Ernest enlisted (presuambly he was conscripted as conscription was introduced in June 1916) on 9 November 1916 he gave his next of kin as his mother and her address as 167 Jervois Road, Ponsonby, Auckland. Following his death and the issue of medals etc, the time all his affairs were settled various other addresses are listed among his records: his father was first to be found at 71 Sarsfield Street, Ponsonby; then Victoria Road, Avondale, Ponsonby. Although Ernest gave his mother as next-of-kin, his father seems to have exercised his legal rights to be recognised as next of kin – possibly hinting that they were no longer living together, though this may be reading too much into the record (both are named in his CWGC record as being at Victoria Road). Prior to his formal enlistment on 9 November, Ernest had been medically examined on 16 October. The examination recorded that he was 5’9″ (1.75m) tall and weighed 12st10lb (81kg) with a 37.5″ chest which expanded to 41″ (95cm-104cm). He had a “medium” complexion, blue eyes and dark brown hair. Unsurprisingly given his connection with church bells, his religion is listed as CofE. He was a carpenter for the tramways company. Formalities over, he was not actually called up until 3 January 1917 when he joined A Company, 24 Reinforcements, and he arrived Featherston Camp on 8 January. After training in New Zealand he embarked on the transport HMT Devon on 5 April 1917. This arrived in Devonport, United Kingdom, on 10 June 1917 (some entries in his record say 11 June) and he proceeded to Sling Camp on Salisbury Plain (the main UK base for the NZEF), arriving there on 11 June. There he joined the Auckland Company of the 4 Reserve Battalion. He was posted to France 6 July 1917 and arrived at the base depot in Étaples on 9 July. He was posted to 3 Company, 3rd Battalion, Auckland Regiment on 25 July 1917, presumably to replace casualties from the fighting at Messines. On 4 October 1917 the New Zealand Division played a key role in the Battle of Broodseinde suffering heavy casualties. It was to be during this fighting that Ernest was killed. Although his record details his burial as taking place at the map reference “D.15.A.21 about 100 yds NW of Otto Farm Pill Box” it seems that when battlefield clearance occurred after the war his body could not be found: he is commemorated on Panel 1 of the New Zealand Apse of the Tyne Cot Memorial to the Missing. The New Zealanders were badly hit on 4 October, but worse would follow when they were thrown into the Second Battle of Passchendaele, the bloodiest day of battle for New Zealand. Thus there was no shortage of dead and wounded to report. 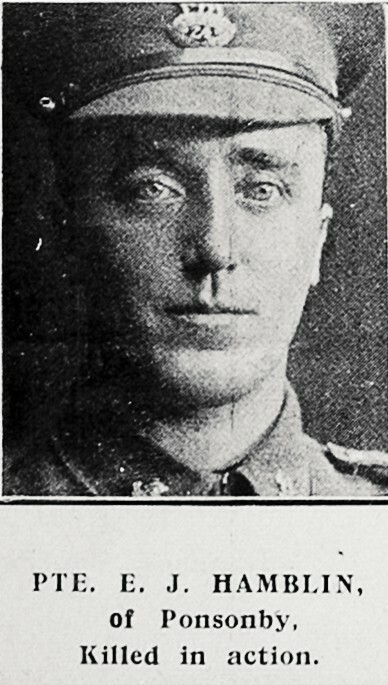 Nevertheless, on 1 November 1917, among the many photographs published in the Auckland Weekly News was that of Pte E J Hamblin. 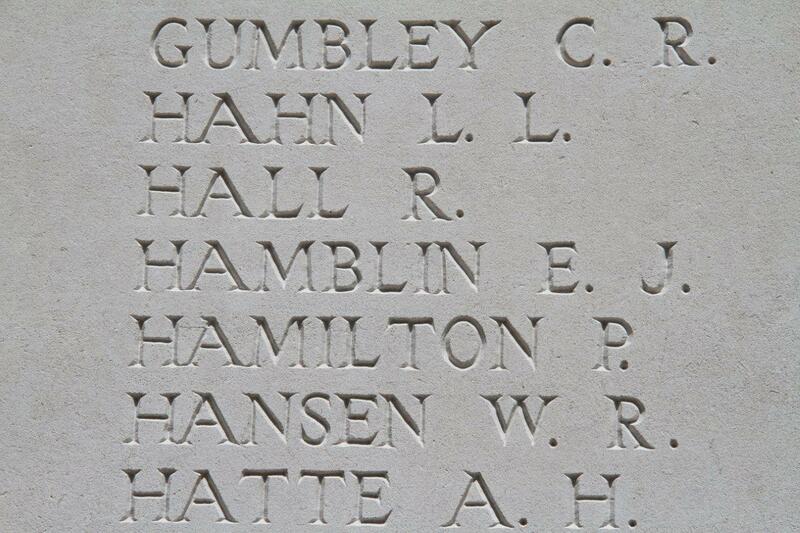 The impact of his death on his blood family is hard to gauge from the records, beyond the in memoriam published on the first anniversary of his death, “In loving memory of our dear son and brother, Private Ernest James Hamblin, killed in action, October 4, 1917. Ever remembered” (a similar notice was also published on the seventh anniversary). On the wider ringing family that impact is easier to see. Despite his departure to the other side of the world he is represented on at least three memorials in England: the Roll of Honour of the Central Council of Church Bellringers, this illuminated manuscript is held in the bell tower of St Paul’s Cathedral, and is also available online; The Winchester Diocesan Guild memorial in the belltower of Winchester Cathedral (an account of the unveiling of the memorial can be found in the online highlights of the guild archive); and of course he is also to be found on the Surrey Association roll. Despite his contribution to ringing in New Zealand, all three remember him as a Hersham ringer. His photo also still hangs in the ringing chamber at Hersham, along with that of George Basil Edser who was also killed in the war. It appears to be a copy of that which appeared in the New Zealand press, or at least taken on the same occasion. A report in the (Auckland) Observer on 7 December 1917 does show one impact on the surviving family. Stephen was effectively granted exemption from conscription on the grounds of his being the only son at home, and his brother having been killed in action. New Zealand records show that Stephen married Irene Vera Murter in 1919. Helena Kate Hamblin married David Archibald Roger in 1926, due to restrictions on access to birth records I’ve not been able to discover if either had any children. Charles James Hamblin died aged 78 in 1941 and Alice Augusta aged 82 in 1947. Stephen died in 1963, Helena not until 1991. No further trace of Ada has been found. A fortnight ago I visited Belgium on a tour with Twickenham Choral Society, 11 April was spent in the area of Ypres, including a brief tour of the battlefields. Scheduling issues sadly meant that we did not have time to visit Tyne Cot, where I had hoped to pay my respects to Ernest. However, we gave a concert at Ypres Cathedral, and also took part in the nightly Last Post ceremony at the Menin Gate where Ernest’s fellow Hersham ringer, George Basil Edser (killed just under two months before Ernest) is commemorated. I laid a wreath on behalf of the choir, and both Ernest and George were very much in my mind as I did so. There is a short video showing part of the ceremony on the choir’s Facebook page. This entry was posted in Auckland Regiment, Hersham, October and tagged ANZAC, Auckland, Auckland Regiment, Bellringing, Ernest James Hamblin, First World War, Hersham on 24/04/2013 by davidunderdown95. Hersham, St Peter – an unexpected Kiwi and a mystery captain. Four men from Hersham served, two did not live to tell the tale, one of the worst casualty rates in the Association. However, Ernest James Hamblin and his family had in fact left Hersham in 1909, they were in Woking for the 1911 census, and Ernest emigrated to New Zealand later that year. He was joined in Auckland by his parents and two sisters in 1913. His father was also a ringer and they both continued ringing at St Matthew’s-in-the-City in Auckland. Both Ernest and George Basil Edser jr were also members of the Winchester Diocesan Guild (Edser was a former honorary secretary of the Yorktown District), they are recorded under that Guild on the Central Council roll of honour, and also on the WDG memorial in the tower of Winchester Cathedral. Edser’s father (George Basil sr) was also a ringer at Hersham. Coincidentally neither man has a known grave, and they died within two months of each other. Both are commemorated by photographs in the ringing chamber. In researching Hamblin I had to branch out into some new sources, these included the outgoing passenger lists on FindMyPast, but via a specualtive web search on his name, I also came across the Auckland City Council Bicycle Register Database 1910-1923. This showed that both Ernest and his father registered bicycles after moving to Auckland, and added some additional addresses. He is also recorded in the Cenotaph database created by the Auckland War Memorial Museum, and unlike in the UK army service records were not affected by enemy action in the Second World War, so his complete service record survives. I will draw more on these sources in subsequent posts. John Loveridge could have been a very dfficult case as he had no overseas service, but fortunately both an entry in the Surrey recruitment registers, and a reasonable proportion of his service record survived. William Alfred Woodrow has proved unexpectedly diffcult to resolve all details about. His initials are actually given as W R in the original roll, but census records and obituaries in The Ringing World made basic identification reasonably straightforward. I have also been able to locate some of his personnel records for his career with the London and South West Railway (which even includes an annotation indicating the dates when he was on war service) – after grouping into the Big Four in the 1920s he presuambly continued working for Southern Railway, but those records are not yet available. There is also an entry for him in the Surrey recruitment registers. However, the original roll indicates that he held the rank of captain, and I cannot find any entries for his commissioning in The London Gazette or any sign of an officer’s service record at The National Archives, nor an entry in the Army List. However, I understand that some railway staff were given only honorary commissions, and it may be he falls into this category. If not, the roll could be further in error, there is a medal card for someone serving in Waterways and Railways in the Royal Engineers with the rank of Second Corporal. 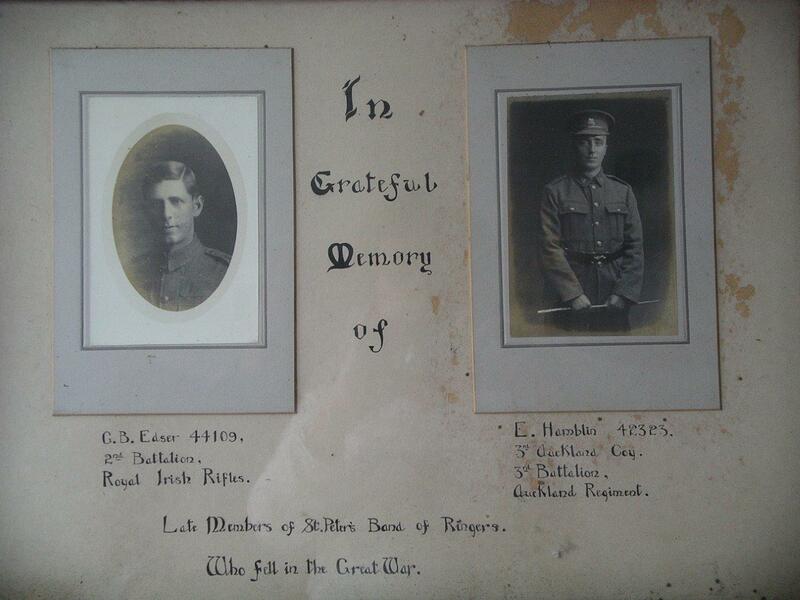 This entry was posted in Hersham and tagged Bellringing, Ernest James Hamblin, First World War, George Basil Edser, Hersham, John Loveridge, William Alfred Woodrow on 08/01/2013 by davidunderdown95.